The Convention was a pretty great time, where contacts were made, lots of nerdy tech was talked, and much hanging out occurred. 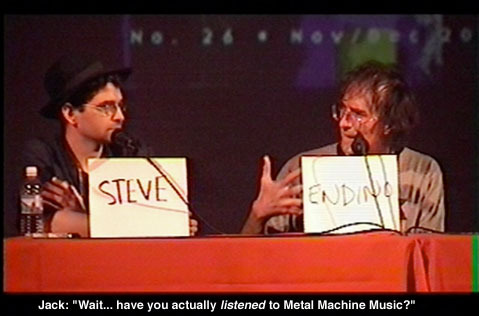 Steve Albini and myself were on a panel along with Larry Crane, Tony Visconti and other nice folks. This one fellow who came over from Ireland had his camera eye on Steve and I, and sent me these photos later. I barely know Steve, having only met him and hung out a couple times, but he has always been quite pleasant to me. We've worked with some of the same bands over the years. His keynote speech at the convention was a laff riot. 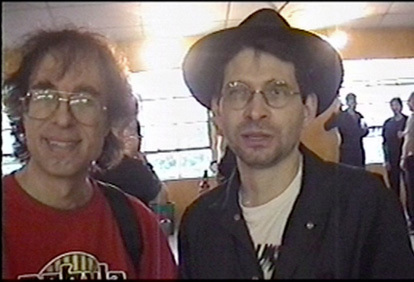 At the after-hours party at Hangar studio, the same Eire-ish gent, Mark O'Connor, caught us again on his video camera, seconds after heckling the two of us with that "So what was it like working with Nirvana?" question. (Our careful reply: "Hey, guy, your beer is spilling all over the camera.") These are the only photos I have, but you can see more on Mark O'Connor's website, and still more on Eddie Ciletti's website, and perhaps even more at TapeOp.com.